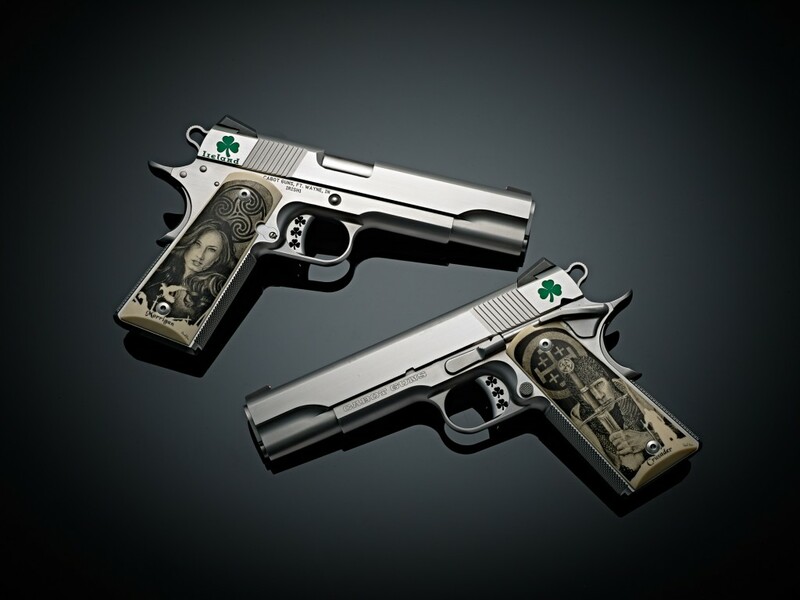 The desires of our client to pay tribute to his Irish heritage spawned the development of a one-of-a-kind set of bespoke pistols with a thematic focus on Irish history. 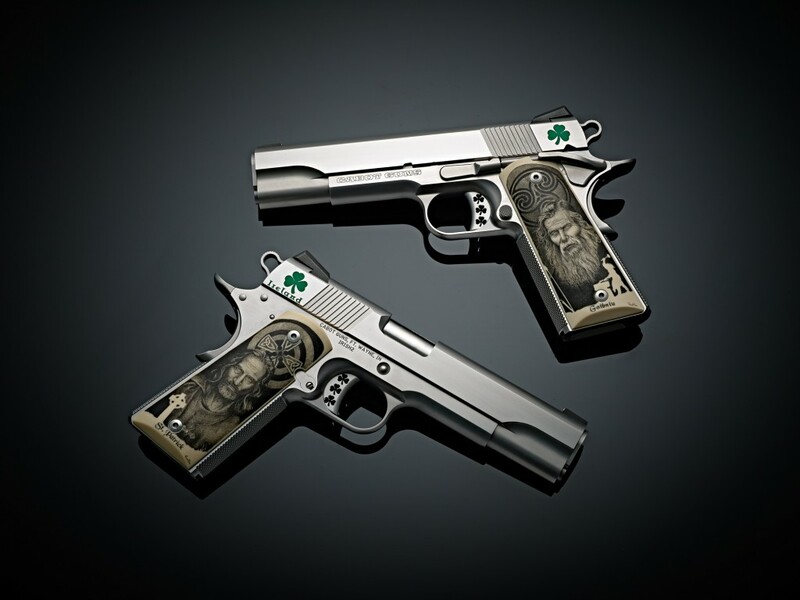 One side of pistols tributes pre-Christian mythological Ireland and the other Christian Ireland. 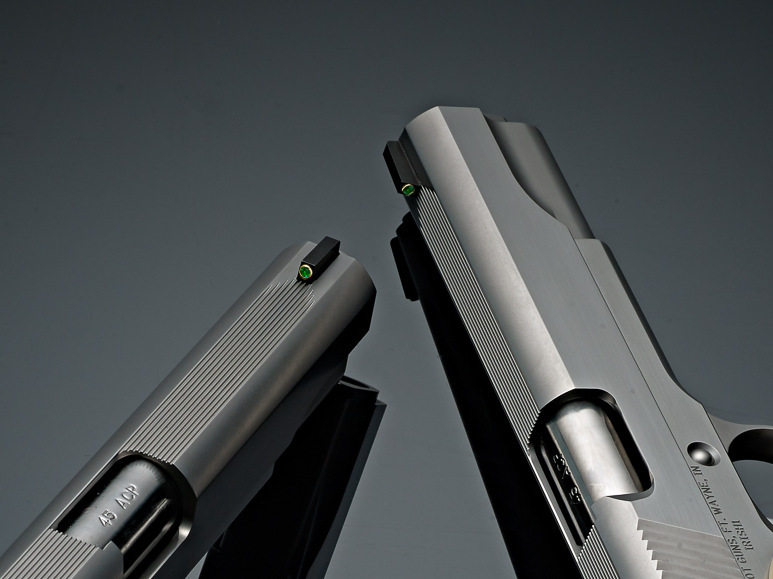 The initial step towards the creation of any OAK grade pistol project is merely listening to the client’s expression of their unique vision and dream for their new Cabot 1911 pistols. With a vision in hand, our creative team dives deep into the subject matter by examining first-hand source materials, history books, literature, artwork, and historic artifacts to formulate a design that will capture the unique vision of the client in a highly personal manner. It is this level of involved attention to heirloom qualities that make Cabot 1911’s so special. 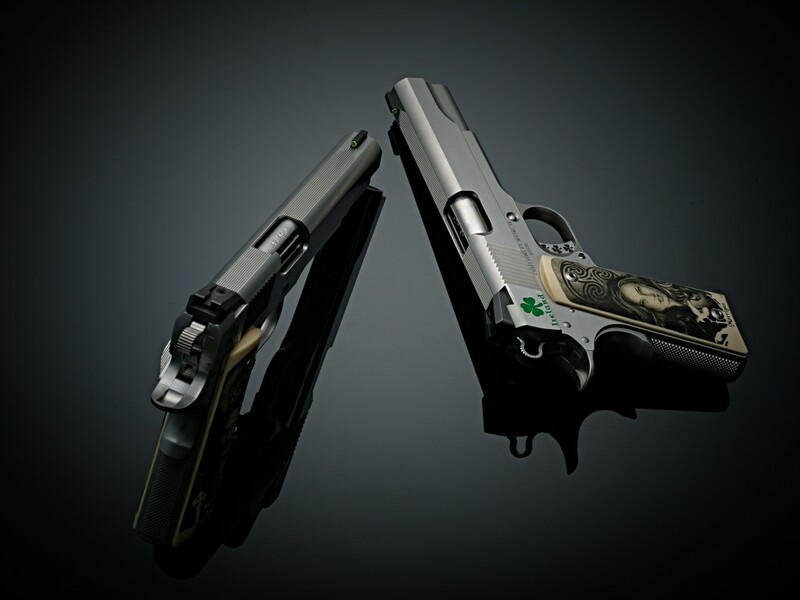 The canvas for such an heirloom set of pistols was born from a block of American steel with frames, slides, and components crafted to the aerospace tolerances which have set Cabot 1911’s apart from the rest of the industry. Clean lines. Crisp corners. Ballistic art on its own merits. Irish theme detailing such as traditional shamrocks were electric discharge machined with exacting precision in each of the triggers while the rear of each slide is emblazoned with the same classic symbol of Ireland. 12,000-year-old wooly mammoth tusk was sourced and fashioned it into perfectly proportioned and exquisitely shaped grip panels. 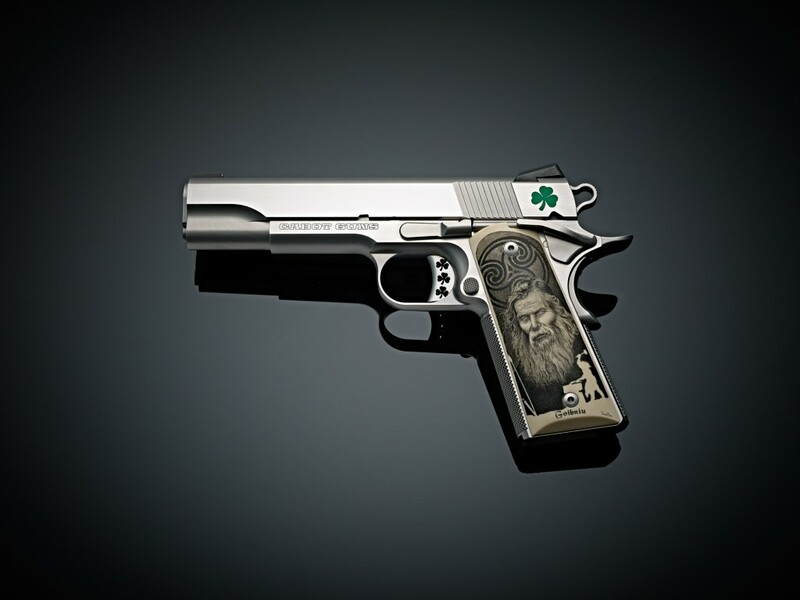 Lore of Irish war, weapons, and religion formed the imagery for reflection on the grip panels and the effort to bring this imagery to life was entrusted to Master engraver and scrimshander Darrel Morris. Hundreds of painstaking hours were required to hand stipple the museum quality engraving on each grip panel. Every single one of the hundreds of thousands of stippling dots was masterfully and individually placed with a precision sharpened carbide scribe, ink, and a hand of the master artisan. Grip panel one depicts Morrigan, the Irish Celtic Goddess of War depicted in one of her many forms as a young and beautiful goddess as it is in this form that she was most often seen on the eve of battle. Her swirling hair represents the maelstrom of battle. Behind Morrigan is a Celtic Triskele which dates back to the Neolithic era. This triple spiral is thought to represent the three realms, land, sea and sky.. Morrigan is one of the Tuatha De Danann. The Tuatha De Danann are mythical who occupied Ireland before the arrival of the Celts. Below Morrigan are battlefield symbols representing Morrigan’s status as the goddess of war, including a raven. According to Celtic legends, Morrigan would appear over battlefields in the form of a raven. The second grip panel depicts Goibnu, weaponsmith of the Tuatha De Danann. Mr. Morris chose to represent Goibnu with a wise and powerful face to highlight his wisdom and skill. His pale eyes represent his otherworldly quality. Behind Goibnu is a Celtic Triskele which dates back to the Neolithic era. This triple spiral is thought to represent the three realms: land, sea, and sky. It is also said to represent Goibnu as a member of the Tri Dee Danna – the three gods of art – who together, forged the weapons that the Tuatha De Danann used in battle. Below Goibnu is his own silhouette, his shadow in the act of forging weapons for the gods. The third of the gip panels features Saint Patrick, the patron Saint of Ireland during his life as a fifth-century Romano-British Christian missionary. This depiction of Saint Patrick is of a vital middle-aged man. Rather than the typical white bearded version, Saint Patrick is shown at the prime of his life with the unimaginable kind of strength of character required to persuade and convert the Pagan Irish Kings to Christianity. To the rear of Saint Patrick, a halo can be seen in the form of an Irish Cross. The even-armed cross within a circle symbolizes the meeting places of divine energy, of self, nature, wisdom, and divinity. 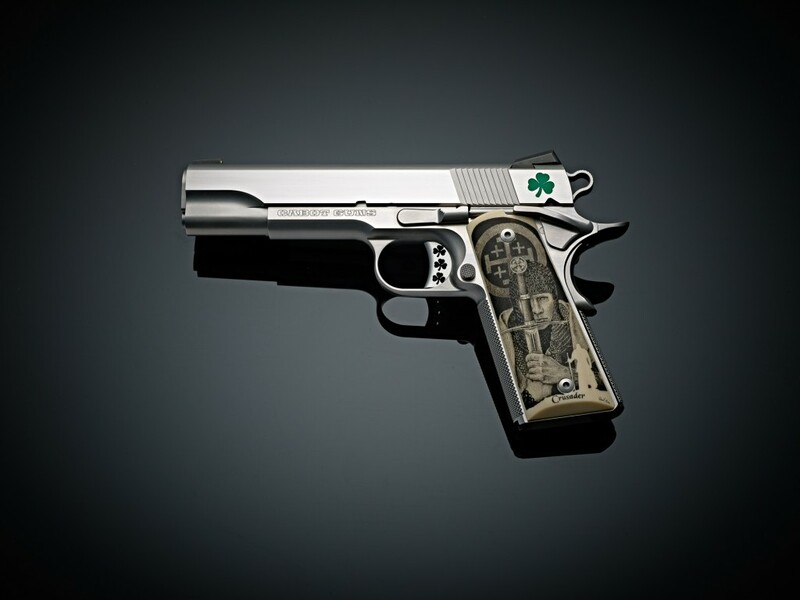 At the bottom of the grip is a stone Celtic Cross which Saint Patrick is credited as bringing to Ireland. The final grip panel is adorned by a Crusader Knight to honor the devout Norman-Irish crusaders who fought in the holy land. The crusader knight is depicted as a young warrior but with seasoned eyes that reflect a lifetime of experience even at a tender age. 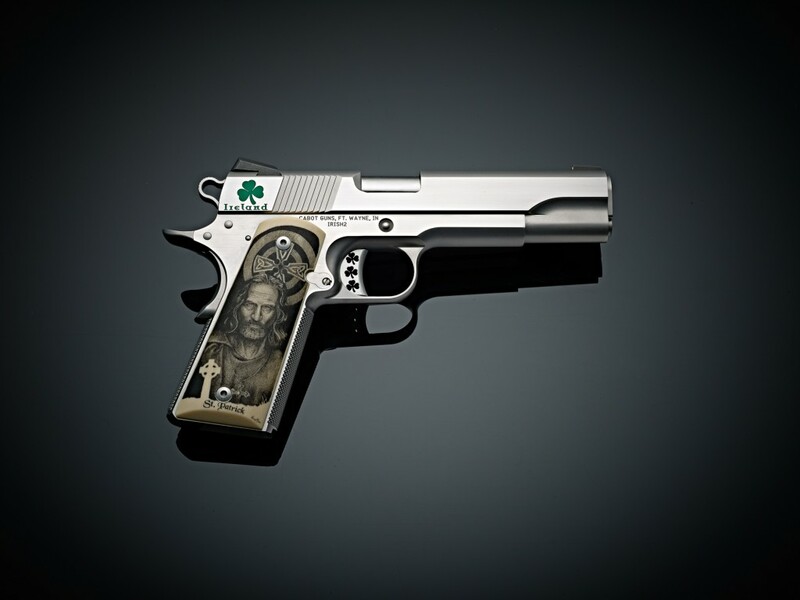 In the pommel of the sword is an Irish cross, a symbol of his faith and ancestry. To the rear of the crusader knight is the Jerusalem cross which is a heraldic cross used as the emblem and coat of arms for the kingdom of Jerusalem from the 1280’s. The five-fold cross is said to symbolize Christ and the four quarters of the world. Finally, the lower portion of the grip panel depicts a crusader knight standing guard, ready to defend the faith. Interested in your own Cabot Custom? Call 855-THE-1911 or fill out the form below to begin. Schedule a phone consultation. We're here to help and answer your questions! Primary Interest Collector Grade 1911 Mirror Image Pistol Set Pistol Made From Damascus Steel Pistol Containing Meteorite Elements Not sure, but I want something awesome! ..they would shut us down. Join our email list to be notified first when we have new releases and announcements.